Great Arrivals is a progressive gift basket company offering more than 200 different gift options for just about every occasion or holiday. Originally they were created by two women that left their corporate careers in search of something they could call their own. Today they have one of the largest gift basket retail sites online – and a powerful mission to satisfy every customer and every gift basket recipient. A gift basket merchant with a robust inventory and dedication to convenient online shopping. Great Arrivals does have a large variety of baskets to choose from – but we do wish they were a little more organized. Their vast selection and clunky menu can sometimes make it hard to find just the type of basket you may be looking for. That being said, this is a minor issue and when you take the time to actually browse, you will find all of their varieties. They have a lot of gourmet baskets, including snacks, cheeses, wines, diet/health baskets, chocolates, coffees and food items. They also include wine gift baskets – complete with food pairings. They are one of the few to offer pet and dog gift baskets – so you could buy a gift basket for furry friends. They also offer golf, gardening, spa, sports and patriotic gift baskets that include non-edible options. Great Arrivals has a large selection of baskets to choose from, but if you want to design-your-own, you will be out of luck. They also do not have any add-on option – which is something we hope they will add in the future for better customization. There is no option to swap out specific ingredients in the basket (though we have yet to see many vendors that will let you do this). To make up for this short coming, they do have a large variety of baskets in the same category – so you can search until you find the exact basket you’re looking for. Great Arrivals does have a good list of holidays and occasions to choose from. You can also use their search bar to find a specific type of basket. They cover all major holidays and then also offer specialty and occasion baskets, such as anniversary, new baby, get well, housewarming, etc. Shoppers can also search by “Recipient” type to help narrow down the choices. They do offer sugar-free and Kosher gift baskets, but do not have vegan or gluten-free options at this time. Their menu does not cover all sentiments or occasions, and if you search for things like “graduation” you will not find graduation-specific gift baskets. This could be an issue for people shopping for a specific occasion and want a basket that applies only to that rather than a general gift basket. 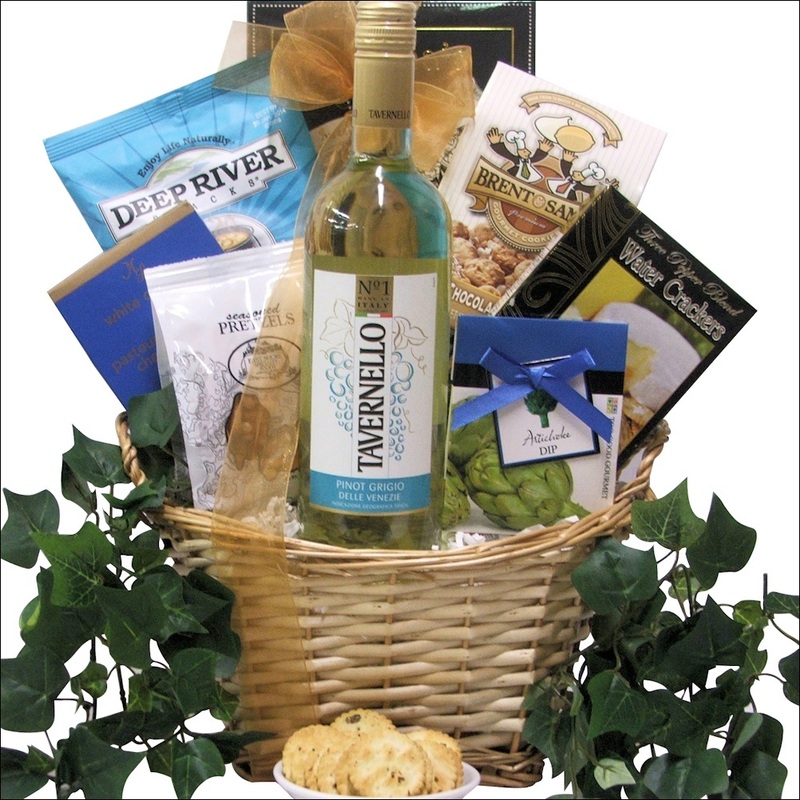 There are corporate gift baskets premade online through their corporate menu. These are categorized into gourmet, wine and holiday gift baskets. For corporate buyers there are specialty programs that can be partnered with Great Arrivals, including employee programs, client programs and brand building. They do offer volume discounts ranging from 5 to 10 percent off – and special discounts for volume bulk orders over $20,000. There is a dedicated customer service line for corporate buyers as well and multiple orders can be placed online or via their faxed order system. They do also offer branded gift baskets and customized corporate orders for companies that want to incorporate corporate colors or even their logos. The majority of their baskets range from $40 to $250 – with wine gifts costing the most. Compared to other companies, their baskets are priced competitively and they offer a robust selection of products in each basket for the price. That being said, their baskets are on the smaller size when compared to other companies and prices – so some may feel they get more for their buck elsewhere. They do have a special menu option for specials and sales, but the majority of the products listed in there are for best sellers and not necessarily discounted. All baskets are shipped statewide with free ground shipping. This is done with US Postal Service and FedEx and takes between one to five days (Monday through Friday). They do not deliver on Sunday, but Saturday delivery may be possible. They also offer expedited shipping, but do not provide rates for this – instead, it depends on the basket size and where it is being shipped to. They do allow international, APO/FPO shipping and picking a future delivery date. We hope that in the future they can offer some general expedited shipping price ranges – like most of their competitors do. That way individuals shopping for last minute gifts have an idea of what they would spend if they shopped with Great Arrivals. For wine shipments, they cannot ship to states that do not allow wine imports – such as Utah. Items are all packaged creatively and the biggest/main item is in the center with the smaller gift basket items fanned out to the side. They use the typical basket and do not feature any high-end basket options. Unfortunately it is hard to preview baskets online (no zoom feature) and they don’t list the individual product sizes – just the overall dimensions of the basket. You can, however, add a personalized gift message for your recipients when ordering from Great Arrivals. Their return policy is not very clear and they encourage people that are unsatisfied with their products to call customer service. All baskets can be returned in 14 days – but wine gift baskets cannot be returned. Because baskets must be returned in original packaging, it may be hard for some recipients to actually return the basket and receive a refund. They do not offer a satisfaction guarantee or even discuss one within their company policy and they do not offer exchanges – something to consider when shopping online with a company you’ve never purchased from before. Great Arrivals does not offer any recourse if a product arrives late – instead, that is placed on the shipper. Great Arrivals is available via their toll-free number and email. They do not have any live chat options nor do they have a FAQs section. They do have plenty of information on their site, but it may be easier to find if it was all categorized into a single FAQs page. As of 2015, the Great Arrivals brand was accredited with the BBB (since 2007) and carried an A+ rating. That means they do deliver on the promises they state on their site – always a plus when shopping online. Free ground shipping on all baskets in the United States. Under $50 – Most of the baskets under $50 are less than 10 inches in size and feature smaller sized treats and candies. In fact, some are in buckets instead of baskets. $50 to $100 – These baskets often include sampler snack sizes, some with wines, etc. The average size of baskets within this range are 12 to 16 inches long. $100 to $200 – The best selection of baskets falls into this price point and include things like multiple bottles of wine, gourmet snacks, chocolates, fine cheeses, etc. Also, the majority of these baskets are over 20 inches long to accommodate the extra products. $200 and up – There are not a lot of baskets offered over this price point and those that are often feature multiple bottles of wine (but in sampler size), snacks and gourmet items. They are over 24 inches in length. Great Arrivals does have a large selection, but their higher prices and smaller sizes along with no last minute shopping will make them unideal for all shoppers. They, instead, are more for those looking for gourmet baskets, free shipping and do not mind waiting a bit before their recipient receives their gift basket. Great Arrivals does have a lot of baskets that include wines, but what makes them really unique is their specialty baskets – including pet and doggy gift baskets (something not all merchants offer). We also like that they offer free ground shipping on all baskets – which is very rare for these types of companies. There is unfortunately a few things we are not a fan of with Great Arrivals, such as their smaller basket sizes for lower priced items, unclear expedited shipping policies and even their vague return/exchange policy. Under $50 - Most of the baskets under $50 are less than 10 inches in size and feature smaller sized treats and candies. In fact, some are in buckets instead of baskets. $50 to $100 - These baskets often include sampler snack sizes, some with wines, etc. The average size of baskets within this range are 12 to 16 inches long. $100 to $200 - The best selection of baskets falls into this price point and include things like multiple bottles of wine, gourmet snacks, chocolates, fine cheeses, etc. Also, the majority of these baskets are over 20 inches long to accommodate the extra products. $200 and up - There are not a lot of baskets offered over this price point and those that are often feature multiple bottles of wine (but in sampler size), snacks and gourmet items. They are over 24 inches in length.